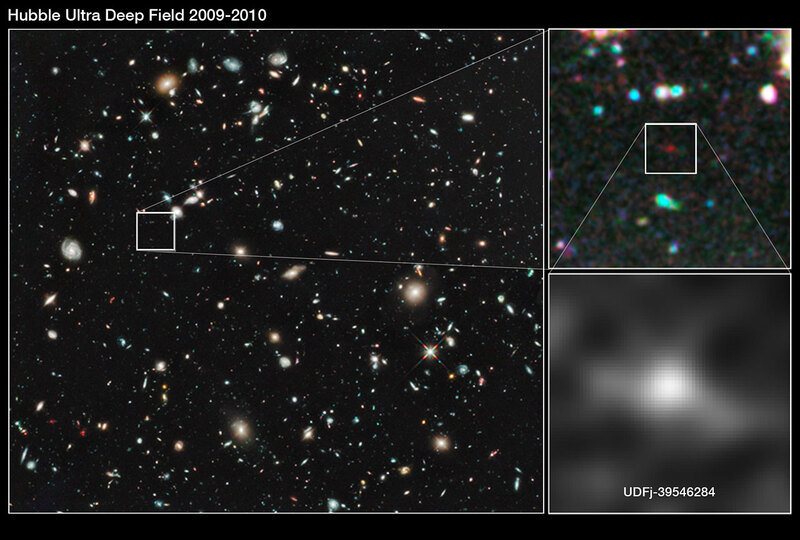 Pushing the Hubble Space Telescope to the limit of its technical ability, an international collaboration of astronomers have found what is likely to be the most distant and ancient galaxy ever seen, whose light has taken 13.2 billion years to reach us (a redshift of around 10). Astronomers have pushed the NASA/ESA Hubble Space Telescope to its limits by finding what is plausibly the most distant and ancient object in the Universe  ever seen. 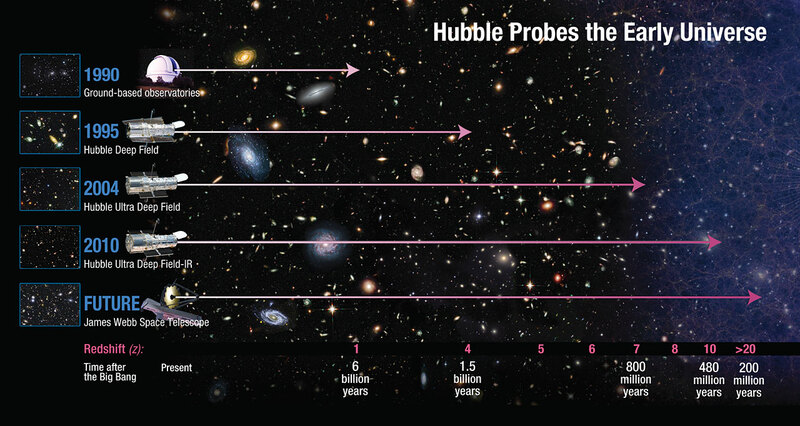 Its light has travelled for 13.2 billion years to reach Hubble , which corresponds to a redshift around 10. The age of the Universe is 13.7 billion years. The dim object, called UDFj-39546284, is likely to be a compact galaxy of blue stars that existed 480 million years after the Big Bang, only four percent of the Universe’s current age. It is tiny. Over one hundred such mini-galaxies would be needed to make up our own galaxy, the Milky Way. This galaxy would be more distant than the population of redshift 8 galaxies recently discovered in the Hubble Ultra Deep Field, including the current most distant spectroscopically confirmed  record holder at a redshift of 8.6 (eso1041), and the redshift 8.2 gamma-ray burst from 2009 (eso0917). A redshift of z = 8.6 means that the object is seen as it was around 600 million years after the Big Bang. “We’re seeing huge changes in the rate of star birth that tell us that if we go a little further back in time we’re going to see even more dramatic changes,” says Garth Illingworth of the University of California at Santa Cruz. The astronomers were surprised, as this new result suggests that the rate at which galaxies were forming stars grew precipitously, increasing by a factor of ten over the 170 million years that elapsed between the era of this newly discovered candidate galaxy and that of the population of previously identified galaxies at a redshift around 8 (650 million years after the Big Bang). “These observations provide us with our best insights yet into the likely nature of the earlier generation of primeval objects that we are yet to find,” adds Rychard Bouwens of Leiden University in the Netherlands. Astronomers don’t know exactly when the first stars appeared in the Universe, but every step further from Earth takes them deeper into the early Universe’s formative years when stars and galaxies were just beginning to emerge in the aftermath of the Big Bang . “We’re moving into a regime where there are big changes afoot. Another couple of hundred million years back towards the Big Bang, and that will be the time when the first galaxies really are starting to build up,” says Illingworth. Bouwens and Illingworth are reporting the discovery in the 27 January issue of the British science journal Nature. The even more distant proto-galaxies that the team expects are out there will require the infrared vision of the NASA/ESA/CSA James Webb Space Telescope (JWST), which is the successor to Hubble. Planned for launch later this decade, JWST will provide the spectroscopic measurements that will confirm today’s report of the object’s tremendous distance. 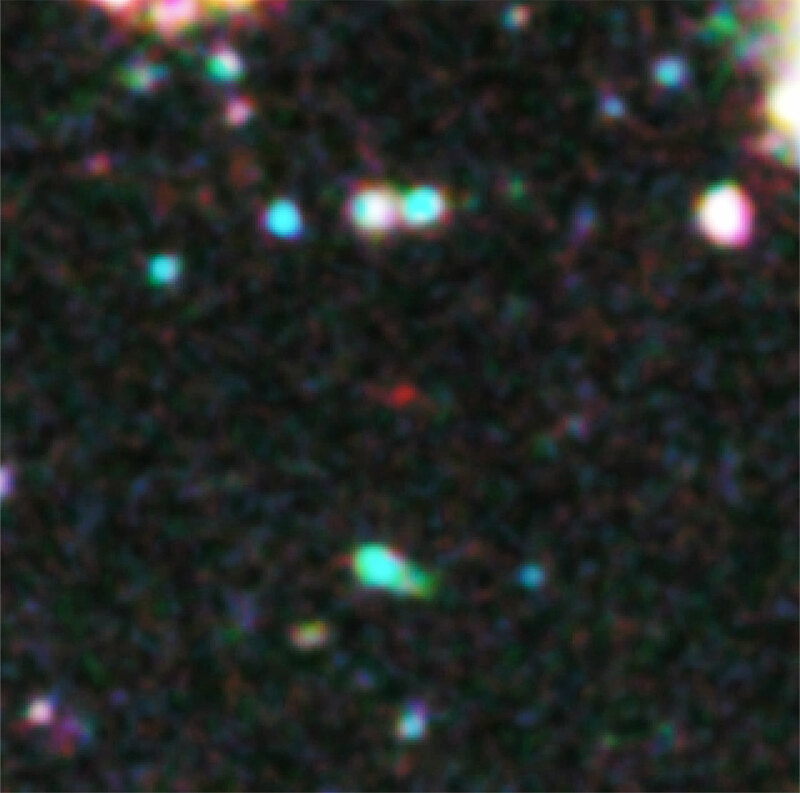 A year of detailed analysis was required before the object was identified in the Hubble Ultra Deep Field — Infrared (HUDF-IR) data taken in the late summers of 2009 and 2010. The object appears as a faint dot of starlight in the Hubble exposures, and although its individual stars can’t be resolved by Hubble, the evidence suggests that this is a compact galaxy of hot stars that first started to form over 100-200 million years earlier, from gas trapped in a pocket of dark matter. The proto-galaxy is only visible at the longest infrared wavelengths observable by Hubble. This means that the expansion of the Universe has stretched and thereby reddened its light more than that of any other galaxy previously identified in the HUDF-IR, taking it to the very limit that Hubble can detect. JWST will go deeper into infrared wavelengths and will be at least an order of magnitude more sensitive than Hubble, allowing it to hunt more efficiently for primeval galaxies at even greater distances, at earlier times, closer to the Big Bang. Astronomers plumb the depths of the Universe, and probe its history, by measuring how much the light from an object has been stretched by the expansion of space. This is called the redshift value or z. In general, the greater the observed z value for a galaxy, the more distant it is in time and space, as observed from our position in the Milky Way. Before Hubble was launched, astronomers could only see galaxies out to a z of approximately 1, corresponding to an era halfway through the history of the Universe. The original Hubble Deep Field, taken in 1995, leapfrogged to z = 4, or roughly 90 percent of the way back to the beginning of time. The Advanced Camera for Surveys (ACS) produced the Hubble Ultra Deep Field of 2004, pushing back the limit to z ~ 6. ACS was installed on Hubble during Servicing Mission 3B in 2002. Hubble’s first infrared camera, the Near Infrared Camera and Multi-Object Spectrometer reached out to z = 7. 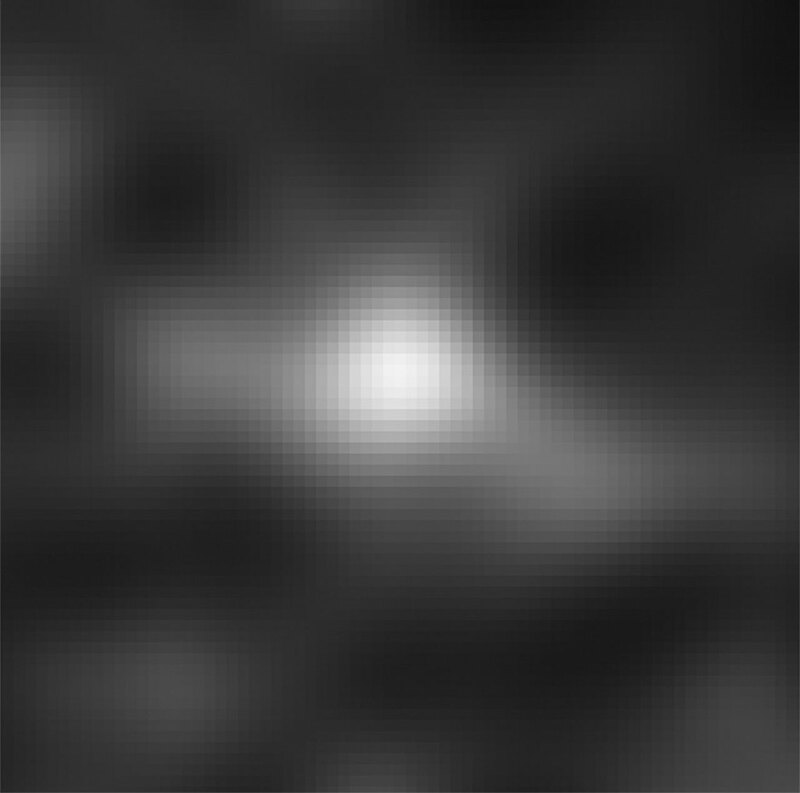 The Wide Field Camera 3 (WFC3) first took us back to z ~ 8, and has now plausibly penetrated back for the first time to z = 10. The James Webb Space Telescope is expected to extend this back to a z of approximately 15, 275 million years after the Big Bang, and possibly beyond. The very first stars may have formed between z’s of 30 and 15. 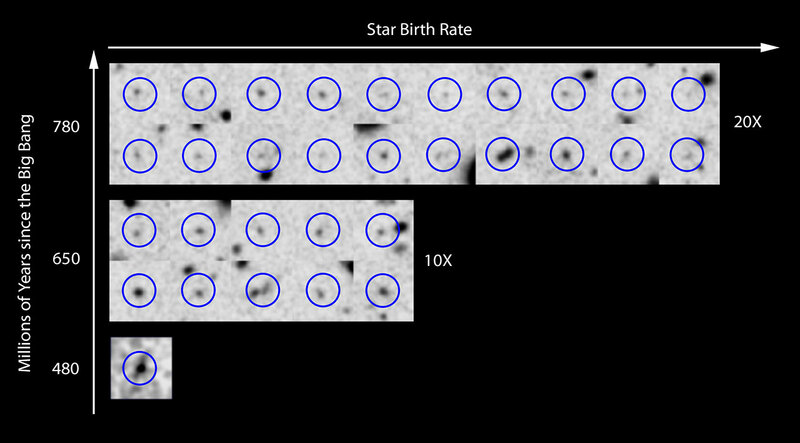 Likely candidates for distant galaxies can be identified and have their redshift estimated by carefully studying them in Hubble images taken through a range of different filters. The galaxy will be visible only in some of the filters. An estimate of the redshift can be deduced from the colour of the last filter in which the object is detected (a technique known as photometric redshift). However, redshifts can only be confirmed through spectroscopic study, in which the light from a galaxy is split into its constituent wavelengths for analysis. This newly discovered candidate galaxy is too faint to be studied spectroscopically by any telescope in operation today, but the forthcoming NASA/ESA/CSA James Webb Space Telescope will be equipped to do so. The hypothesised hierarchical growth of galaxies — from stellar clumps to majestic spirals and ellipticals — didn’t become evident until the Hubble Space Telescope Deep Field exposures. The first 500 million years of the Universe’s existence, from a z of 1000 to 10 is now the missing chapter in the story of the hierarchical growth of galaxies. It’s not clear how the Universe assembled structure out of a darkening, cooling fireball of the Big Bang. As with a developing embryo, astronomers know there must have been an early period of rapid changes that would set the initial conditions which made the Universe of galaxies what it is today. How far does Hubble see?